Includes: 1 - E.M.T. 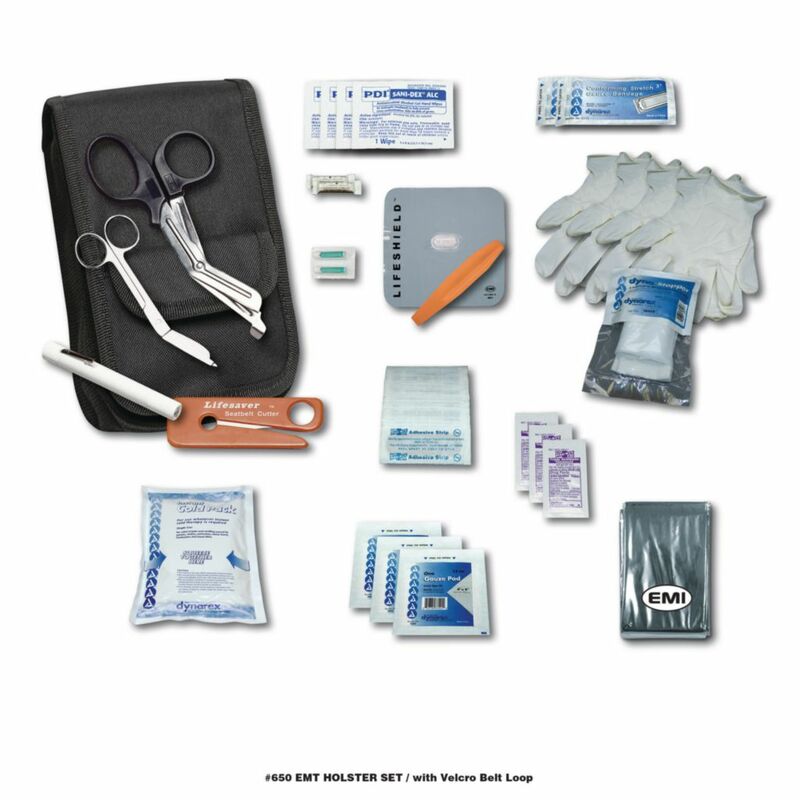 Holster, 1 - CPR Lifeshield, 1 - Bite Stick, 1 - Thermal Rescue Blanket, 1 - Deluxe Shears, 1 - 51/2" Bandage Scissor, 1 - Penlight, 1 - Lifesaver Seat Belt Cutter, 2 - Ammonia Inhalants, 2 - Bee Sting Swabs, 3 - Antibacterial Ointments, 4 - Antibacterial Wipes, 3 - 4" x 4" Compresses, 2 - 3" Sterile Conforming Bandages, 1 - Instant Ice Pack (5" x 9"), 10 - 1" x 3" Adhesive Bandages, 4 - Latex Gloves, 1 - Burn/Blood Stopper Bandage. The specially designed over-sized holster includes a front pocket for medical gloves, and a water repellent protected main compartment. It is made of 1000 Denier nylon cordura. Fits belts up to 21/4" wide and measures 81/2 x 5 x 3".